My son got a hit in his baseball game and went on to score. His team won 9-0 and he was given the game ball to keep. I was asked by a friend to come to her house and do a tarot reading party (me = the tarot reader). I'd never done a party like that before and was a little nervous, but it was fun, and it seems like the readings resonated with everyone. Heat! Being able to wear shorts! Hallelujah! Finished reading a book. I've had lots of books I've been reading, sort of juggling, so it's nice to be done with one. Refrigerator wasn't as broken as we feared and therefore not as expensive to repair as we thought it might be. The people at the local pet store are so friendly and helpful. I'm glad I shop there rather than at a huge chain. Really fun writing group meeting. Weather was nice enough to open the house windows. Despite gross incompetence at the school, my kids made it home safely. Feeling loved by my kids. My youngest son had his last physical therapy appointment. They said he doesn't need to schedule any more. Yay! A productive day helping in the school library. Brynnde won the weekly cover contest! Now she's up for the monthly finals. So if you voted for her (me/it) last week, please consider voting one more time! I very much appreciate all your support! It was an okay day. Not bad, but not stellar. Just kind of was. So my grateful list consists of things like: being well, having food and clean water and shelter . . . I felt productive in getting stuff done around the house, too, which is always a good feeling. Being able to shop without the kids. My roses are popping open all over my garden, and I love seeing them again! Good writing group meeting. Got some help getting over a hurdle. Brynnde continues to do well. Best weather we've had in a while. Had lunch with a friend, and we sat out on the restaurant patio. Feels like forever since we've been able to do that. My oldest did well with his class presentation. I'd been helping him practice, so it's good to hear that it worked out. New tarot deck and new book to read. Lots of hummingbirds flitting about. A rare day without errands or appointments. Never even had to get in the car for anything. Woke up to an email that my novel Brynnde is up for a cover award. I don't know if it will win—it's rather more of a popularity contest than anything about actual design merit—but it's nice to see it recognized. I can't take credit for the cover, but I do agree it's gorgeous! If you'd like to vote, the contest is here. You have to register to vote, but it's quick and free and they don't spam you or sell off your email. I appreciate any and all support! Survived the busy afternoon and evening. Even got a workout in. Hummingbird flying around my garden this morning. Dyed eggs with the kids. (Yes, a day late.) We used this new process that involved rice and the eggs came out amazing! Felt productive in doing lots of laundry and dishes. Had a nice Easter that involved staying cozy at home. The kids hunted for eggs inside the house (because rain), and the Bunny brought us a fire pit and the makings for s'mores. Now we just need sand and wood and dry weather. Did get a bit of a walk in. Resumed my exercise program. Feel better just for getting back on that horse. Nice seder with our Jewish Culture group. Okay, so I woke up with an acute case of vertigo this morning. I've suffered from bouts of vertigo for years, but hadn't had one—certainly not one this bad—in a very long time. I was bedridden for the first half of the day. So what was good about Good Friday? I was able to get up and shower and walk around by around 1:30. My loving husband came home from work right away when I told him I was sick. My kids did a great job of getting themselves together for school while I shouted instructions from my bedroom. We're fortunate that we live within walking distance of school and the kids were able to get to school without me. Sometimes we just need something to knock us down so we remember how good our lives really are. A whole morning without errands or appointments. I actually got some writing done. Fun time with my writing group this evening. They enjoyed the pages I brought and they also had some great stuff.
. . . I'm breathing? That counts as a good thing, right? The rain wasn't too heavy for me to get in a morning walk. Managed to buy everything we need for Easter. Got lots of laundry done. I don't love doing the laundry, but I do like having done the laundry. I slammed my finger in the door and have a nasty blood blister BUT... It didn't mar my new nail polish. My youngest continues to do well in physical therapy. They say his calf is a bit weak, that's why he still has a slight limp. Once the muscle builds back up, he'll be good to go. The youngest is officially out of his boot and into actual shoes again! He still needs some physical therapy, and he can't do sports for another six weeks, but we've reached the near end of a very long road. Everything went more smoothly than expected. I don't know how else to phrase it. I was prepared for complications and instead everything was simple. Traffic and schedules and just everything. Hair and nails night at the salon. In fact, the salon isn't even open on Mondays but they opened just for me. I feel special! Lunch out with the kids. In-laws have offered us Hamilton tickets! And they'll even babysit!
. . . Honestly, that pretty much counts for all three good things today. Really good Mexican food for lunch (especially the tortilla chips). Fun time out with my writing group in the evening. They changed the April meeting schedule so I won't have to miss the rest of the month, too. Getting writing done in spite of kids being home. BTW, what do you think of "Adelia" for the heroine's name? Productive day around the house, even with the kids being home for spring break. 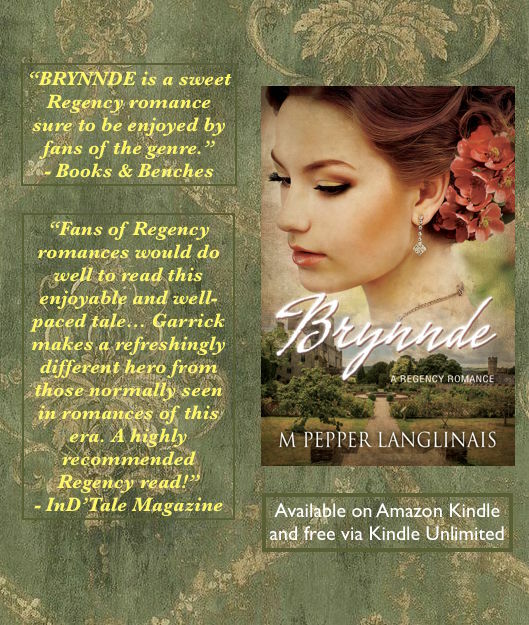 Another good review for Brynnde. It's that time of year again when I can sit outside and read in the sun. Got a nice walk in, too. A piece of mail I thought had been lost arrived. Brynnde has hit its stride and is now my most successful book since my Sherlock Holmes stories. I'm really excited! Nice day for a walk with the kids.